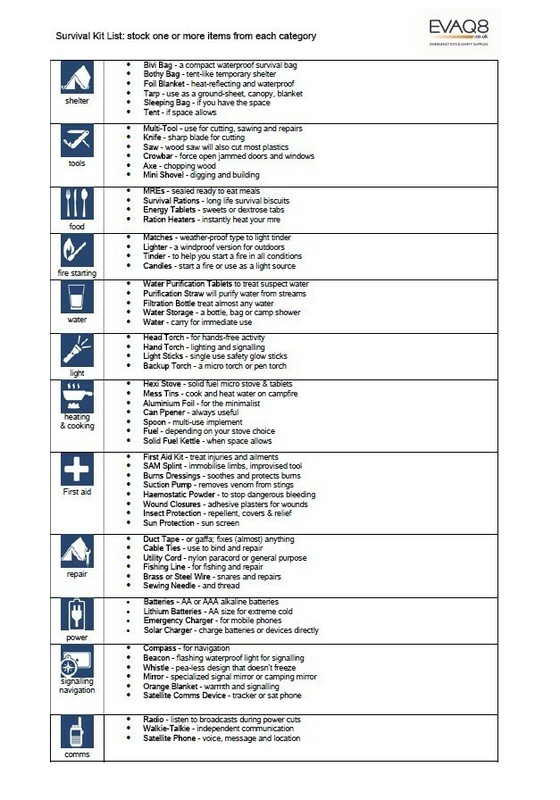 Survival Kit List - What goes in a Survival Kit? What goes into a well designed Survival Kit? A well prepared survival kit is invaluable for any emergency situation. While most survival kits are specifically intended for outdoor survival situations some are primarily designed for urban situations (Go Bags and Preparedness Kits). Many items in your outdoor survival kit list will overlap with your urban survival kit and vice versa. But there are priorities depending on your most likely scenarios. Consider weight, space and other situational priorities when making your choices. Remember to carry high quality items that you know you can depend on in a real emergency or disaster situation. Shelter: If you need to shelter outdoors, pack one or more of these: a tent, bothy bag, waterproof tarpaulin, all-weather blanket or bivi bag. Sleeping bags, foil blankets and ponchos are useful in outdoor as well as urban situations. Water: Have drinking water ready for immediate access, at least 1.5 litres per adult per day. Even when sheltering indoors the water mains could become disrupted. This can be in the form of standard water bottles or long-life emergency water rations. Water Purification: reduce the amount of water stored by packing a roll-up or collapsible water container and commercial water purification tablets. You can then treat water to make it potable. A good alternative is a water purification bottle. Light: a good torch that uses LEDs instead of a bulb is best for most emergency situations. A head-torch will provide personal light while leaving your hands free to complete your tasks. Don't forget spare batteries or choose wind-up technology. First Aid: The type and extent of the first aid kit you pack is dependent on your level of proficiency and training. A universal first aid kit with the addition of burns dressings should suffice for basic purposes. View our curated playlists and read our evidence based Preparedness Blog. Join us on social media.